Playing video files on a computer can be a headache for some people because it involves video codecs. A codec is a device or software that enables media compression and/or decompression for digital media files. Most of the time you won’t know what compression codec is being used to compress the media file, so you install a codec pack to support playing several media files. Many free popular media players like VLC and MPC-Home Cinema are widely being used due to the built-in codecs that allow you to play most, if not all video files without installing a codec pack. Sometimes you might have a home movie file or audio/video file that you want to share with other people, but have no idea whether some, all or even any of them have the right codecs or a compatible media player installed that will play the file. Some users just don’t like running software they’re not familiar with like a 3rd party media player, and it’s probably not the best idea to have novices installing codec packs to play a single file because things can easily go wrong with them if misused. We have previously talked about converting ISO images into self burning executable files, and you can also do a similar thing by making a torrent file download from an exe file. The good thing is, you can also do the same with audio and video files by packaging the media file into a self running executable along with a self contained player, this doesn’t require installation of any codecs or media players to play the file on another computer. Here are 2 tools that can help you do it. 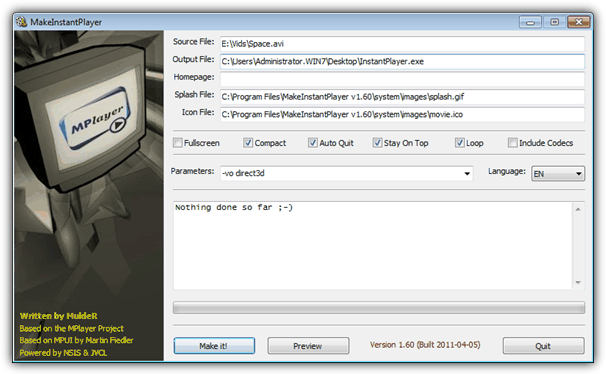 This is a tool designed specifically for converting video (and audio) files into self-running executables. MakeInstantPlayer uses the well known MPlayer engine for playing back the files which supports a vast array of different video and audio formats. Furthermore it uses the open source Nullsoft Scriptable Install System (NSIS) to pack everything into one single executable file. When you install the program it creates no Start menu entries, desktop shortcut or uninstall entry in Control Panel, so it’s essentially a portable tool. Usage is pretty simple, just click the white area in Source file to select the media file to convert, and if you want to change the output executable name and path, click in Output file. There is an option to open up a webpage when the player has finished playing the file, just enter a URL in the Homepage box. A JPG, GIF or BMP splash screen can be displayed while it’s extracting the file and player to your Windows temporary folder. The default icon for the exe can be changed also. There are options to run the integrated video player in full screen or in compact mode (hides menus/buttons), automatically quit the player at the end of playback, keep player window on top of other windows, loop media until the user forces the player to quit and include binary codecs for WMV and Real media files. Click the Make It button, wait for a few minutes and you have an executable file that plays the media file without installing any codec. One problem with MakeInstantPlayer is it tries to compress the media file which most of the time cannot be reduced in size any further, this can make the creation time quite long for large video files. Something to note is during testing it kept failing to create an executable of a 1.5GB MKV file although similar files under 1GB seemed to be fine. 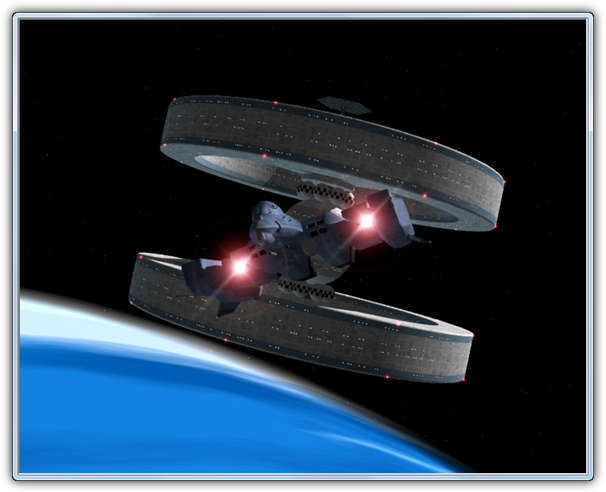 To include the player the overall size of the file increases by around 7MB. Because the executable file will extract the media file and MPlayer to a temporary folder, you need to make sure the computer has enough disk space for both the extracted media file and executable. Audio/Video To Exe is able to take a video or audio file and convert it into a self contained executable not requiring extra codecs or software. The number of conversion options and playback options in the integrated media player are very basic, but this makes it easy for even the most inexperienced of computer users to run. There is also a shareware Pro version which offers more playback options and changing the bitrate. The program is a portable executable in a zip file, and all you need to do is drop the media file onto the window or browse for it, several can be converted in succession if required. Then click on the Create button, the free version can only use Regular playback and Loop or Exit when finished are disabled. The program has no other settings that need configuring and conversion is far quicker than using MakeInstantPlayer with the output file name the same as the original but with a .exe extension. Around 30 formats are supported including AAC, AC3, FLAC audio and AVI, MKV, MP4 video files. When you run the executable video it will open a basic player window with no visual controls whatsoever, however you can press space to pause and use the arrow keys or click in the window to skip or jump backwards or forwards. The far left of the window is the start of the file and the more right you click in the window, the further into the file’s play time it goes. An audio file will show a visual display during playback. Around 6MB is added to the media file’s size to create the exe file, and like the previous tool, extracts the executable to the Windows Temp folder to play the file. 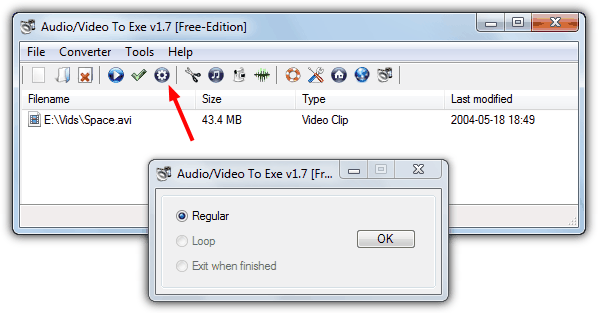 Audio/Video To Exe also has some other useful options such as a simple video converter (bitrates disabled), a video cutter, ID3 Tag editor, capture an image from a webcam and create Wave files from other audio formats. Editor’s Note: As you will no doubt know, malware is often carried in executable files, so it’s not a good idea to download video or audio files packed into executable’s unless you’re certain the source can be trusted, and then make sure to scan the file if you download it. The same applies to files you receive from friends/family, always run a scan before playing them, just in case. Thank you Raymond – very useful. Nice find mate, thanks, cheers!